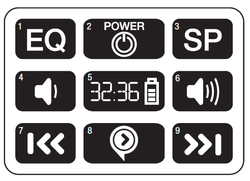 Each press of the EQ button rotates to a new EQ mode. Turns the Playaway on and off. Lowers the volume of the audio. Displays the operating status of the Playaway. Increases the volume of the audio. Commences and interrupts the audio. Moves you further ahead through the audio. Help Guide Courtesy of Playaway for Libraries.